If you’ve ever been out with a big group of friends and tried to rely on text messages to get everyone back together, you already know what an act of futility that can be. “Head to the bar!” “Which bar?” “New phone, who’s this?” The LynQ tracker promises to make rounding up your posse a lot easier. It works similar to a compass, but uses GPS to point the way to a specific person, instead of true north. Up to 12 of the LynQ trackers can be synced together using a simple, one-button interface that can still be operated while wearing thick gloves, or when your hands are filthy. The device is designed to thrive in the outdoors, with three days of battery life, a carabiner clip for keeping it strapped to your person, and a waterproof housing. It doesn’t need cellular connectivity or a data plan to track locations, and it works anywhere on Earth a GPS signal can be detected. As you get closer to a friend, the LynQ’s moving dot gets larger and larger so you can easily tell if you’re going the right way. 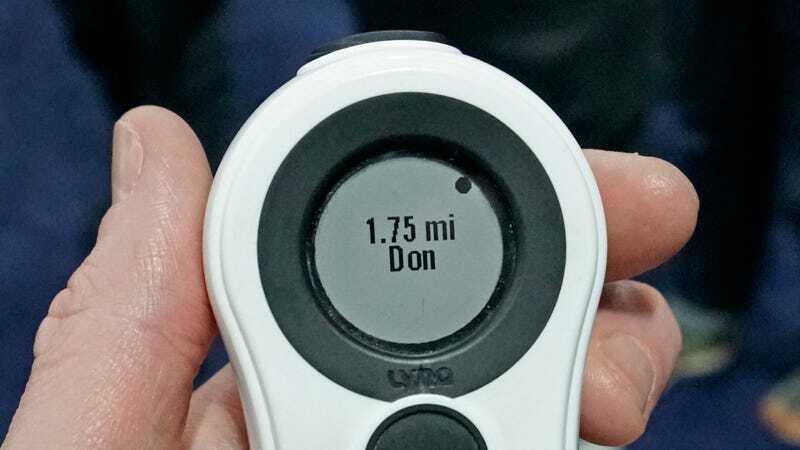 The LynQ’s similarly simple LCD display, which shouldn’t get washed out in direct sunlight, shows the location of one of your 12 connected friends using a dot that moves around the perimeter of the screen and gets larger the closer you get to them. With a range of around five miles, it seems like this device could make it easy to regroup after skiing or a long hike, during a music festival, or while wandering the Vegas strip. You can even set a home location on each tracker, so if you’re braving the great outdoors all by yourself, it can also be used to find your campsite again.